Eileen Everson was born April 29, 1927 in Comberton, England to Reginald and Ellen (Hawkes) Poole. She lived and worked on the farm that her family operated throughout WW2. She told stories of the prisoners of war that worked on their farm. In 1955, she met Howard Everson at a dance, and they began their courtship. Howard was serving in the Air Force in England at that time. When he returned to the United States they continued through letters. In 1956 she left England to marry Howard in Council Bluffs, Iowa. From there they left for Salina, Kansas to begin their married life. She became a US Citizen on September 27, 1963. In 1963 they adopted a daughter, Lisa Jane Everson. In 1971 they adopted a son, Christopher Lynn Everson. The military moved them several times during their marriage, they retired in Hartselle, AL. 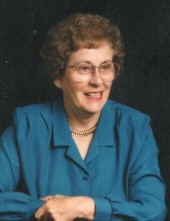 Eileen returned to Missouri after her husband’s death on September 4, 2018 and resided in Harrisonville MO. Eileen was a real estate agent in Missouri and Alabama. She is survived by her daughter Lisa Everson of Harrisonville, MO and her son Chris Everson, of Hartselle, AL. Cremation with inurnement will be at the Missouri Veterans Cemetery in Higginsville, Missour will be held at a later date. Memorial contributions may be made to the Alzheimer's Association and may be sent in care of the Dickey Funeral Homes, P.O. Box 432, Harrisonville, Missouri 64701. To plant a tree in memory of Eileen Margaret Everson, please visit our Tribute Store. "Email Address" would like to share the life celebration of Eileen Margaret Everson. Click on the "link" to go to share a favorite memory or leave a condolence message for the family.